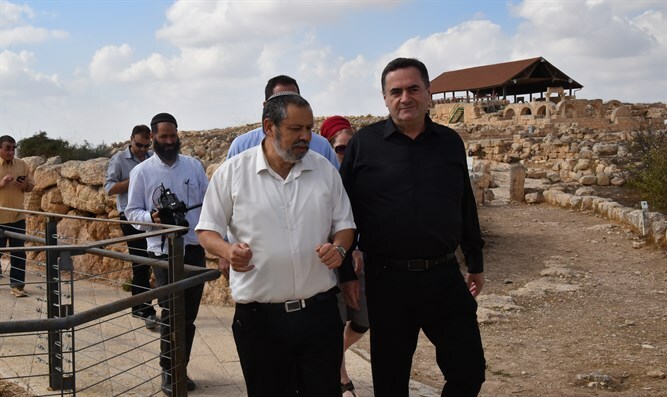 Transportation and Intelligence Minister Yisrael Katz (Likud) toured the Mount Hevron Regional Council on Wednesday, inaugurated Route 316, visited the national heritage site in Susya, and met with residents there. At the beginning of the day, Minister Katz attended the inauguration ceremony of Highway 316 in the Yatir Forest in the Hevron Hills. Repairing the road was included as part of the Transportation Ministry's investments in the area. The road enables the connection between the Hevron Hills area, Beer Sheva and the northern Negev settlements to be tightened. In recent years, Minister Katz has worked with his ministry in cooperation with the Mount Hevron Council to repave and renovate roads traversing the Hevron Hills, renew junctions and add lighting, erect a new transportation terminal and double the number of public transportation lines. During the tour, the Minister met with residents and leaders of the communities who wished to thank him for his ministry's massive activity, easily discernable in the Hevron Hills area. "We thank and appreciate the work of the Transportation Ministry headed by Minister Yisrael Katz, who continues the wonderful development of roads in our region," said Yochai Damari, head of the Mount Hevron Council. "For thirty-five years Route 316 waited for the Minister's devoted hand. The road is important in strengthening the connection between the outlying areas and the center of the country, a goal we have placed in high priority." At the road's inauguration, Minister Katz referred to the strategic importance of settling the Hevron Hills and pledged to continue activity to strengthen the area. "It's always quite an experience to be here, one of the most beautiful places in the country, a great privilege to live in the Land of the Bible, to accompany the settlement and to enjoy Yatir wines." "The communities in the council have strategic and substantive importance, and it is important in every way to strengthen the place and its residents. I will do everything necessary to strengthen the region. We are already planning to expand Route 60 within the five-year plan, and to plan additional and broad infrastructure in Judea and Samaria. Route 60 must provide modern, open, safe, and proper transportation." The Transportation Minister said, "We also invested heavily in public transportation in these places as public transport is of great importance. All this will help the important task of bringing more Jewish presence to the region. The development of the area helps all the populations here, both Jewish and Arab residents."